The River Wharfe is probably the most famous of the Yorkshire rivers, maybe because of the top quality fly fishing it provides, or perhaps because it is surrounded by the most outstanding scenery. The River Wharfe rises near Beckermonds, in Langstrothdale, at the head of Wharfedale and flows some 60 miles through the Yorkshire Dales to meet the Yorkshire Ouse at Cawood. On its journey downstream the River Wharfe flows through lovely dales villages such as Buckden, Kettlewell, Kilnsey, Grassington and Burnsall. It also flows past magnificent landmarks such as Kilnsey Crag, The Strid (a narrow gorge through which the river is constricted to a fraction of its size and which has claimed many lives over the years) and Bolton Abbey. The River Wharfe is a similar size to the River Ure and like all the Yorkshire Dales rivers it runs with a peat stain, giving it the appearance of a pint of Yorkshire bitter. Fly fishing on the River Wharfe is outstanding, with good stocks of wild brown trout and some grayling. I consider the River Wharfe to be one of the finest brown trout rivers in the UK with fish of a high average size present in abundance. The River Wharfe also holds good stocks of grayling in places, particularly from Ilkley downstream and in decreasing numbers upstream of Ilkley. The grayling in the upper River Wharfe (like most Yorkshire Dales rivers) have declined over the last 20 years, the area around Burnsall once held huge stocks, but, although they are still present, numbers are nowhere near what they once were. There is good access to the best fly fishing on the River Wharfe with most clubs offering day tickets. I guide on many miles of good and varied fly fishing water, with Bolton Abbey Estate being my favourite for many reasons. Fly fishing on the River Wharfe started a long time ago with anglers fishing with wet flies, or North Country Spiders as they are know. These spider flies were invented for the Yorkshire Dales rivers and other northern, fast flowing, rainfed rivers, using simple, locally available materials. North Country Spiders are still very much in use today due to their success rate. Fishing the North Country Spider is a very enjoyable and relaxing way to fish, however, it also requires a high level of fly fishing skill to fish effectively. Other, more modern fly fishing methods, are also very successful today. The River Wharfe responds particularly well to the duo method of fishing a dry fly and nymph together and also to fishing a single dry fly - the Wharfe trout and grayling are very free rising. Czech Nymphing works very well in the faster flowing pools and the upstream nymph is a very exciting tactic to employ for fly fishing the riffles and shallow runs. I qualified for the England Rivers Team by fishing on the River Wharfe at Bolton Abbey and Burnsall, and I have fished many competitions there in the past. I spend many hours and days, fly fishing, teaching and guiding on the River Wharfe, so I would say that I know the river better than anyone and it is for this reason why I am in constant demand a fly fishing guide for the River Wharfe. If you require guided fly fishing on the River Wharfe, or just a few hours tuition, do please get in touch. At Bolton Abbey on the River Wharfe there are about 5 miles of double bank trout fishing and grayling fishing which deserves a special mention. Bolton Abbey is my favoured location for river fly fishing tuition, guiding, lessons and courses, and a day here is always rewarding. 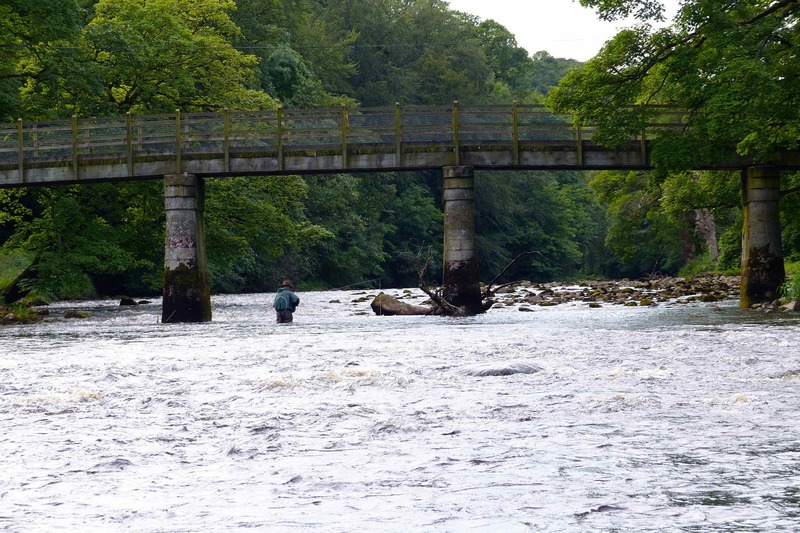 The River Wharfe at Bolton Abbey is particularly suitable for instruction in river fly fishing, with well defined pools, relatively easy wading and good stocks of trout and grayling that respond to most methods of fly fishing. The River Wharfe is very accessible for day ticket fishing for much of its length. From its source near Yockenthwaite, downstream to Ilkley, basically the trout and grayling fly water, I can't think of a single section that isn't available on day tickets.